CSR Activities by Western Engineering (Pvt.) Ltd.
Corporate Social Responsibilities (CSR) is one of the major areas of Western Engineering (Pvt.) Ltd. 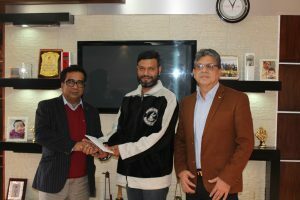 The company is committed to contribute to the society in every possible way.In relation to that Our Honorable Managing Director & Executive Director have handed over 50,000.00 (Taka Fifty Thousand) to the father of a cancer patient. Annual Conference have been on 5th November 2016. Western Engineering (Pvt.) Ltd. has successfully completed it’s First Annual Conference in TCB Auditorium premises on 5th November 2016. Our honorable Chairman and Managing Director were present and gave their valuable insight on current projects in presence of each project managers and engineers from different parts of country. In presence of our Executive Director Brig. Gen. Shawkat Hossain, psc. (Retd.) each Department Chief Engineers discussed and promised to meet the demands of each Project Managers. Western Engineering (Pvt.) Ltd. is renowned for bringing High-Technical equipments to excel the quality of the projects we are working. We are currently working on different land development and River embankment projects and to improve the quality and shorten the time consumption without compromising on quality we approached around the world for Batching Plant & Auto Block Casting Machine. Therefore our expert procuring department collected information around the world to find the best mechanism to fulfill our existing environment, manpower system and improve our project output. After several discussions with higher authorities, Western Engineering (Pvt.) Ltd. decided to do business with QGM Quangong Machinery Co., Ltd & ZENITH Maschinenfabrik GmbH. To inspect the quality and facilities of these companies our two highly efficient representatives Engineer Rauphun Karim & Tanver Ahmed Khan (AGM) visited these companies in China before shipment. http://www.westernengineeringbd.com/wp-content/uploads/2016/08/logo-we-il-ab.png 0 0 Western Engineering http://www.westernengineeringbd.com/wp-content/uploads/2016/08/logo-we-il-ab.png Western Engineering2016-11-10 09:28:582016-11-22 13:41:02We are purchasing new Block Machine from china. Annual conference held on 05 November, 2016 to discuss about the progress of the ongoing project. http://www.westernengineeringbd.com/wp-content/uploads/2016/08/logo-we-il-ab.png 0 0 Western Engineering http://www.westernengineeringbd.com/wp-content/uploads/2016/08/logo-we-il-ab.png Western Engineering2016-11-10 09:27:462016-11-14 06:38:44Preparation on going for upcoming Annual Conference.